Blowout .... In My Trunk ??? 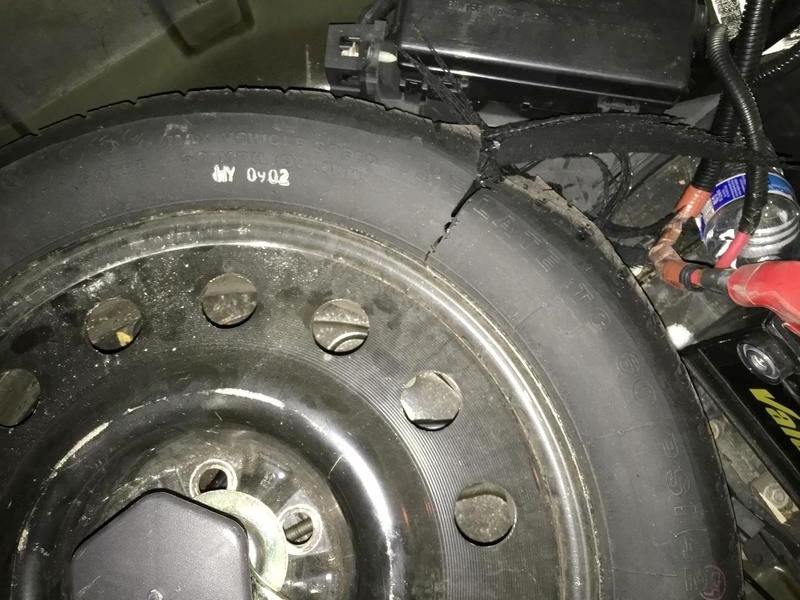 A quick google search when I got home revealed that this particular Firestone temp tire (T185/R60/17) was prone to this activity for no particular reason other than age (no recall or compensation available). Sure glad it happened in the trunk and not at the moment of need. Unfortunately, the replacement was also an adventure as no one has them used (gee I wonder why ), and only one tire manufacturer still makes the size (Maxxis). $159.00 later plus shipping ($15) and mounting ($15) I'm back in business . Anyone else had a trunk blowout ????? I must say, in all my years experience with automobiles, (6 years working for auto dealers in the service dept. too) this is a first for me, Buck! Never in my 60 years on the planet. Wow. Very unusual for sure. I had a 1977 Mercedes 450SL with the stock, factory spare still in the trunk! It stayed in there at least up until we sold it a few years back to get the wife's Corvette. The tire looked "vintage" to say the least but it did hold air although we never had to actually test it out in real use.